I grew up with well water, and we had a water softener. When I got married, we had city water in our home with decent water. About four years ago, we moved to a farm with well water. The previous owners didn't use a water softener, and we didn't think much about it at first. As the months went on, we started having problems with our water. We have a sediment filter to get out some of the impurities, but it wasn't enough. My dishes were spotty, my sinks are always spotty after cleaning them, and my bathtub was perpetually orange from the rust. The hard minerals also deposit themselves on your skin and hair, so we all had itchy skin, couldn't get soap or shampoo to lather good, and my hair always looks dull. Morton Salt graciously sent me a new water softener to install, and I am loving it so far. My husband installed it himself, and I have a video below so you can see what's involved for the installation. When water flows through rocks, sand, and soil, it picks up minerals like magnesium and calcium. These extra minerals aren't harmful, but they can cause problems for your hair and skin. These two minerals can build up on your hair, making it lifeless and dull. You could use a clarifying shampoo, but you'll just add more minerals back to on your hair when you rinse. Since my hair was dull and lifeless, I was using a lot of oils to make my hair softer and look shinier. I was using a high end shampoo and conditioner followed by argan oil in my hair every time I washed it. I also used a shine spray to keep it looking shiny. 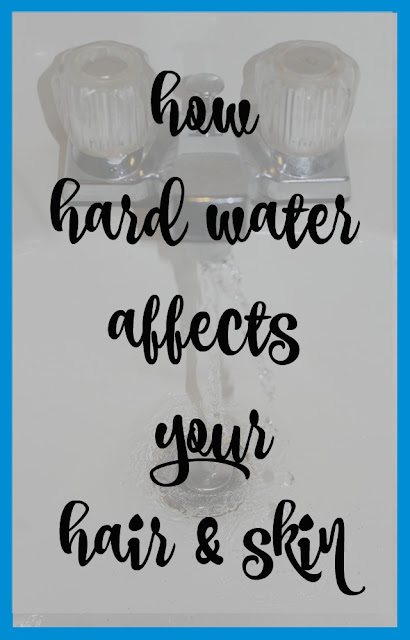 Hard water also makes it harder for soap and shampoo to lather. I know I definitely use more shampoo to get a good lather, and I also use more hand soap. I have eczema on my hand, so I think this was really aggravating my skin because too much soap isn't good for eczema. My husband is a great handyman, so we do nearly all of our home improvements ourselves. He had all of the tools, so we just needed to buy some PVC pipes, elbows, and the parts to go from copper pipes to PVC. You will need pipe cutters and either PVC cleaner and adhesive or solder and a blowtorch to join copper. The entire installation took about 3 hours. Morton Salt also sent me a water hardness test strip so we could test our water. I knew our water was hard, but this gave me a good starting point to set the water softener. We did adjust it higher because we have a lot of iron in our water. You can request your own test strip to test your water at home. Since we have iron in our water, we opted for the green bags of salt. The Morton Salt Rust Remover pellets remove 15x more iron than plain salt. Morton Salt sent me coupons for four free bags of salt, so I was able to fill my water softener for the first time. Ladies, you'll love the Morton salt bags because they have a handle on top. I have a hard time lugging around heavy bags, but these aren't too bad with the handle. I can get them down to the basement and fill the softener by myself. I was showering in that! I have no idea how we lived here for four years without getting a water softener! The first time I washed my hair, I used my usual amount of shampoo, but it was entirely too much. It will take a few weeks, I think, to get the minerals out of my hair, but my hair does look shinier already. I stopped using the argan oil because it was weighing down my hair on day two, so my hair looks a lot better between shampoos. My eczema was getting pretty bad on my hand, and it had even started getting cracks in the skin. I use less soap now, so my skin is starting to feel much better. I also noticed that my daughter and I aren't using lotion several times a day like we were before the softener install. We are thrilled with our new Morton water softener! Along with better skin and hair, my dishes are cleaner, and my tub is finally white for more than a day after cleaning. Learn more about your water and request your test strip today to see if your home could benefit from a Morton Water Softener!